The results of this paper are not very surprising, but what is surprising is that it was published in Nature Climate Change. This is not because the article is bad, but because the politics of publishing research on geoengineering has been remarkably hostile. In 2007, colleagues and I (lead by Andy Lacis) wrote this paper which was well-executed and extremely interesting, but nobody would touch it. Despite years of speculation and vague talk, peer-reviewed research on geoengineering is remarkably scarce. Nearly the entire community of geoengineering scientists could fit comfortably in a single university seminar room, and the entire scientific literature on the subject could be read during the course of a transatlantic flight. Geoengineering continues to be considered a fringe topic. Many scientists have been reluctant to raise the issue for fear that it might create a moral hazard: encouraging governments to deploy geoengineering rather than invest in cutting emissions. Indeed, geoengineering ventures will be viewed with particular suspicion if the nations funding geoengineering research are not also investing in dramatically reducing their emissions of carbon dioxide and other greenhouse gases. Many scientists also rightly fear that grants for geoengineering research would be subtracted from the existing funds for urgently needed climate-science research and carbon-abatement technologies. But there is a pressing need for a better understanding of geoengineering, rooted in theoretical studies and empirical field measurements. The subject also requires the talents of engineers, few of whom have joined the small group of scientists studying these techniques. And last year (2010) I wrote a fellowship grant to look at geoengineering impacts and, perhaps not surprisingly, it did not get funded (of course, I'd like to blame that on the politics and not my lousy writing...). Anyway, enough prologue. Here's the actual article that came out. No real surprises, but still worthy of note for the reasons above. Abstract: If implementation of proposals to engineer the climate through solar-radiation management (SRM) ever occurs, it is likely to be contingent on climate sensitivity. 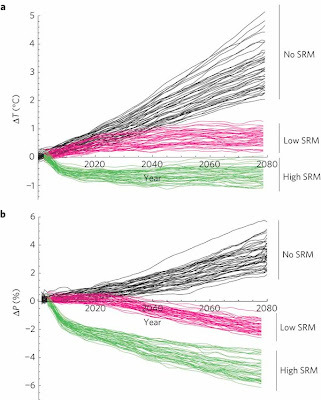 However, modelling studies examining the effectiveness of SRM as a strategy to offset anthropogenic climate change have used only the standard parameterizations of atmosphere–ocean general circulation models that yield climate sensitivities close to the Coupled Model Intercomparison Project mean. Here, we use a perturbed-physics ensemble modelling experiment to examine how the response of the climate to SRM implemented in the stratosphere (SRM-S) varies under different greenhouse-gas climate sensitivities. When SRM-S is used to compensate for rising atmospheric concentrations of greenhouse gases, its effectiveness in stabilizing regional climates diminishes with increasing climate sensitivity. 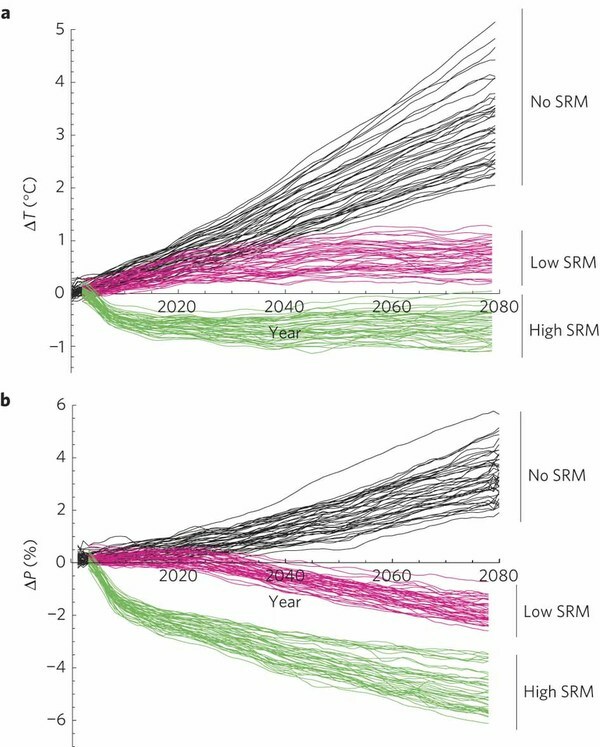 However, the potential of SRM-S to slow down unmitigated climate change, even regionally, increases with climate sensitivity. On average, in variants of the model with higher sensitivity, SRM-S reduces regional rates of temperature change by more than 90% and rates of precipitation change by more than 50%. a,b, Five-year running-mean global mean near-surface (1.5 m) air temperature (a) and five-year running-mean global mean precipitation rate (b), all shown over the length of the 80 model-year simulations. Copyright: Nature Climate Change. I think this thoughtful post by David Archer should quell many of your concerns about methane.